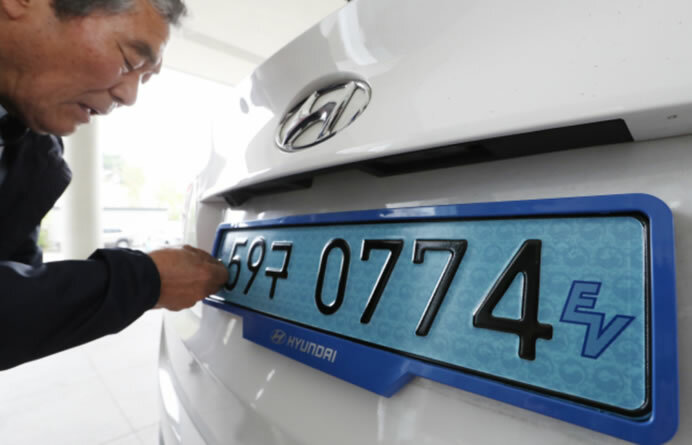 Starting Friday, all newly registered electric cars and hydrogen fuel cell vehicles in South Korea must be mounted with light-blue license plates, instead of the previous white (and green for older vehicles). Back dropped with small yin-yang symbols taken from the Korean national flag, the left of the new plates features a pictogram of an EV, and on the right, a lettered EV. The new license plates are covered with a retro-reflection film, allowing quick identification of the eco-friendly vehicles at parking lots and toll booths, which offer discounted rates for EVs. The Korean Ministry of Land, Infrastructure and Transport also expects the film’s application to help reduce car accidents at nights. The new plates, however, will not be installed on commercial vehicles, like cabs, and hybrid models in order to prevent confusion.